TO THE 2008 NEW CAR GIVEAWAY WINNERS! The New Car Giveaway for Talent Scouting is continuing for 2009! 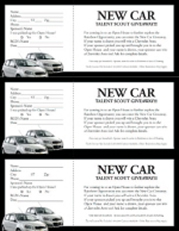 Bring a Talent Scout into Open House and You and Your Talent Scout will be entered into the New Car Giveaway! 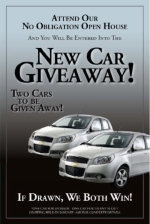 If Drawn - Both you and your Talent Scout will win a BRAND NEW CAR!